The first thing I did today was make arrangements to rent a car for Sunday and Monday. Since my driver’s license was found on Guam, they were able to fax a copy of it to the National Car Rental on Guam, and they in turn faxed it to Saipan. So I’ll have wheels tomorrow! Today my plan was to walk about 5 miles to the Salvation Army building, which offers free lunches 3 days a week to anyone who needs a meal. It’s called Guma Yo’ Ase, which means House of Mercy. Thanks to my new National Park friends, I knew this was the only soup kitchen type place on the island, and I wanted to be sure to get there today since this was a day they were serving meals. It was another hot day, so I armed myself with sunscreen, hat and water and set out. The first 4 miles were familiar, and the walkway along the sea is probably something I would walk on every day if I lived there. There has been a huge navy ship anchored out beyond the reef the entire time I’ve been here, and I started asking people what it was doing, and how long it was there. It turns out there is always a ship there, and sometimes 4-5 of them. 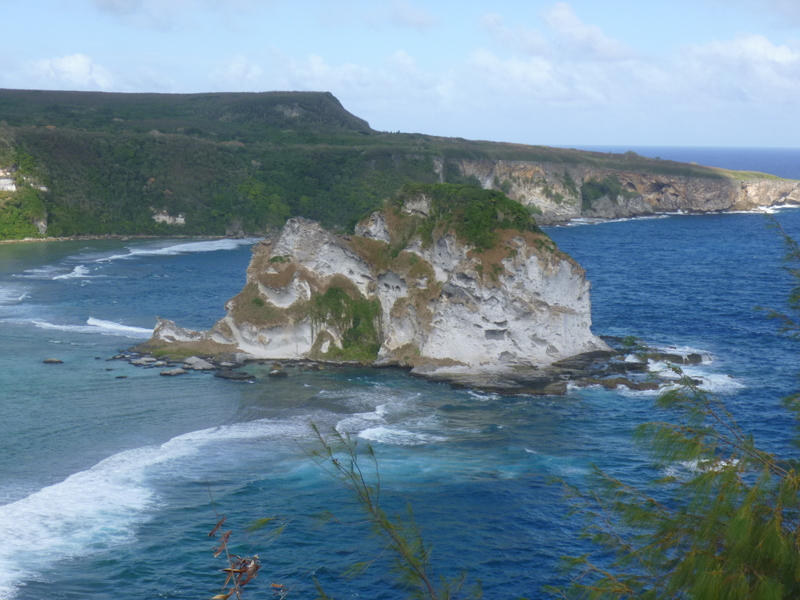 This is on the west side of Saipan, which is the Philippine Sea, and because of the proximity to all the Asian countries, the ships are apparently there keeping an eye and ear on American interests. They have several ships and crews that rotate in and out, but there’s always at least one ship anchored off the coast. Sometimes training exercises are also held on Tinian – the Department of Defense actually leases 2/3 of Tinian, and there has been talk of building a military base there. Despite their small size, these islands are geographically important, and there could be increased military activity in the future due to “re-balancing” forces in the Pacific. Anyway, I walked on – and made a stop at Western Union for some cash from my brother since I have to leave a deposit with the rental car company. It is very strange using cash for all transactions – I’m not used to carrying much around, and I don’t like it! 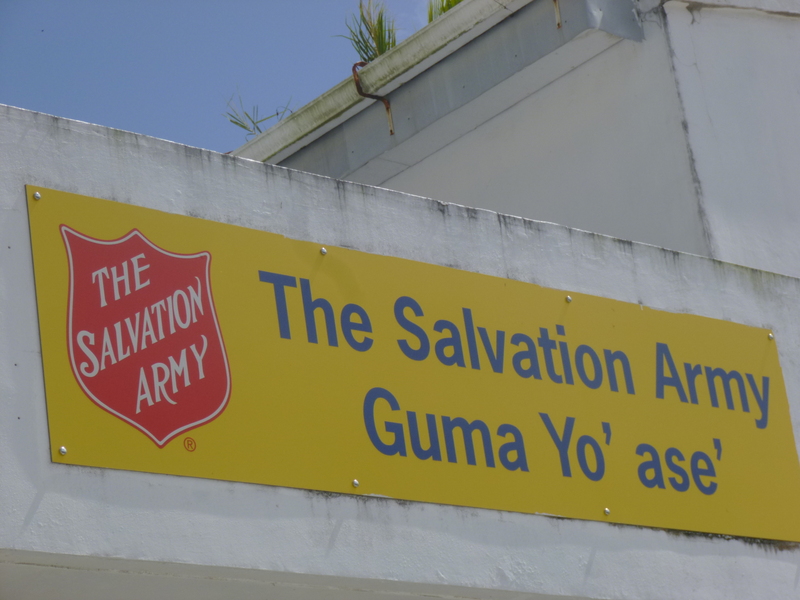 The last mile or so to the Salvation Army was not very pleasant – by this time the walkway by the sea was gone, and I was in kind of an older, congested part of the island, with a lot of small shops and buildings and parking lots full of puddles and traffic. There was no sidewalk and I was happy to finally see the Salvation Army building! 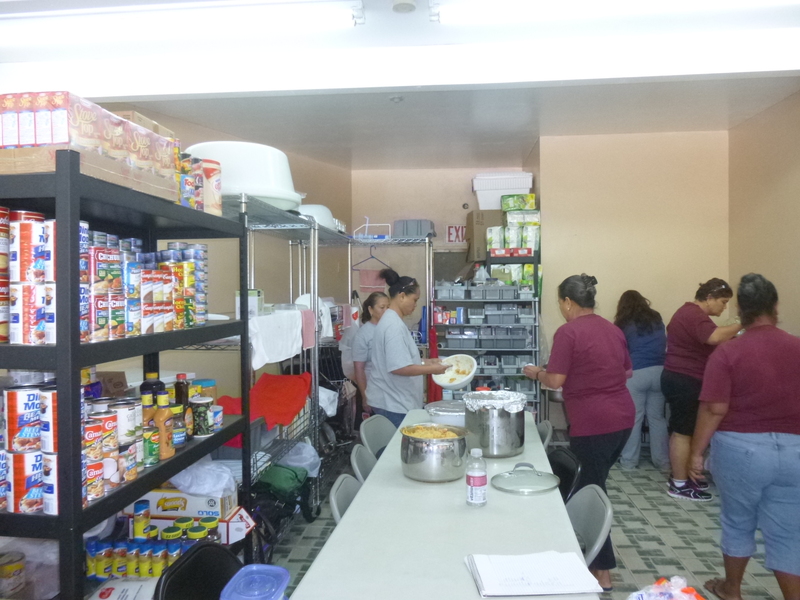 Not only was the soup kitchen open, but the connected thrift shop was too. The thrift shop is open whenever the soup kitchen is, and the proceeds from the thrift shop help support the soup kitchen. I talked to a few people about making my donation, and someone went to find Annie, who is the director of the place. She and her husband are both pastors, and run both the food program here, and one in the central part of the island. We chatted for a while, and I told her what I was doing. People were surprised I had walked all the way there in the heat, but I told them I’m used to it. But I was glad to stop for a while! Annie was about my age, and since they were near the end of the soup kitchen hours, she offered me lunch, and since I didn’t have other plans for the rest of the afternoon, she not only offered to drive me back to the hotel when clean-up was done, but she offered to show me around the island a bit! I told her that wasn’t necessary at all, but she was very kind about it and wanted to do that. So I sat down in the soup kitchen and had some soup, mac and cheese with spam, and a ham sandwich – I had worked up an appetite. There were quite a few volunteers, including a couple of her granddaughters, and they were very efficient. This facility doesn’t have beds for an overnight shelter, but they are able to offer shower and laundry facilities to some of the homeless people. They work very hard to do what they can to help those in need. Annie and I set off in her van with a couple of the grandkids. 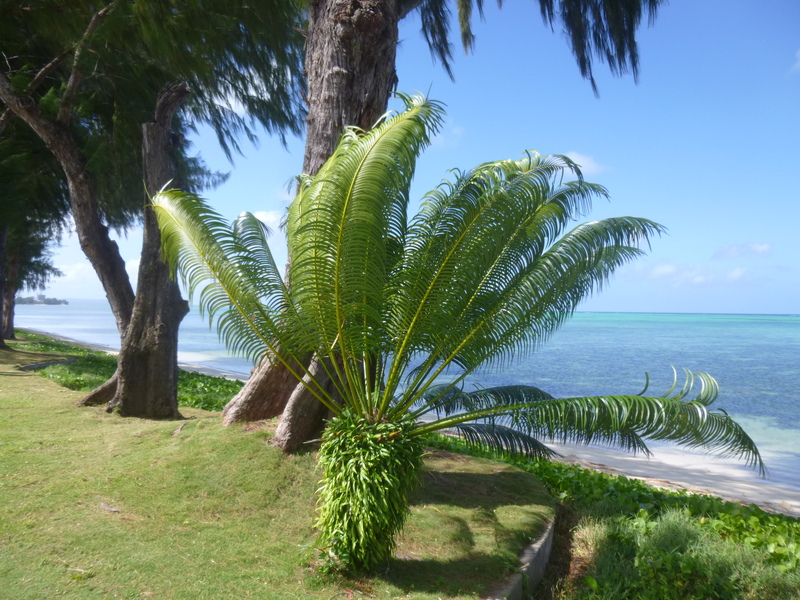 It’s wonderful being shown around by someone who knows so much about the island. 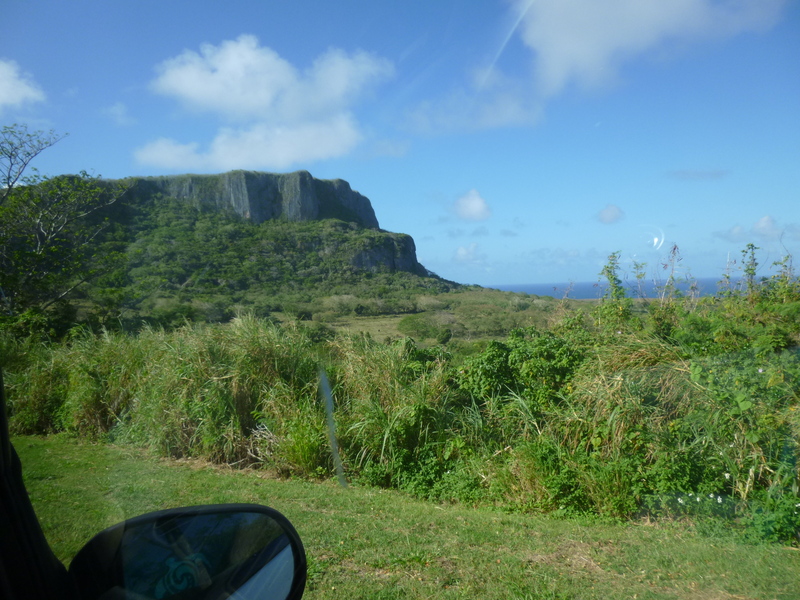 We drove up to the north end of the island, and she pointed out lots of things along the way. We made short visits to some of the memorials and Banzai Cliff and she pointed out Suicide Cliff – giving me a good idea of where to head tomorrow. She drove down to some remote local beaches that I never would have found on my own, and then we stopped to look at Bird Island and a grotto. 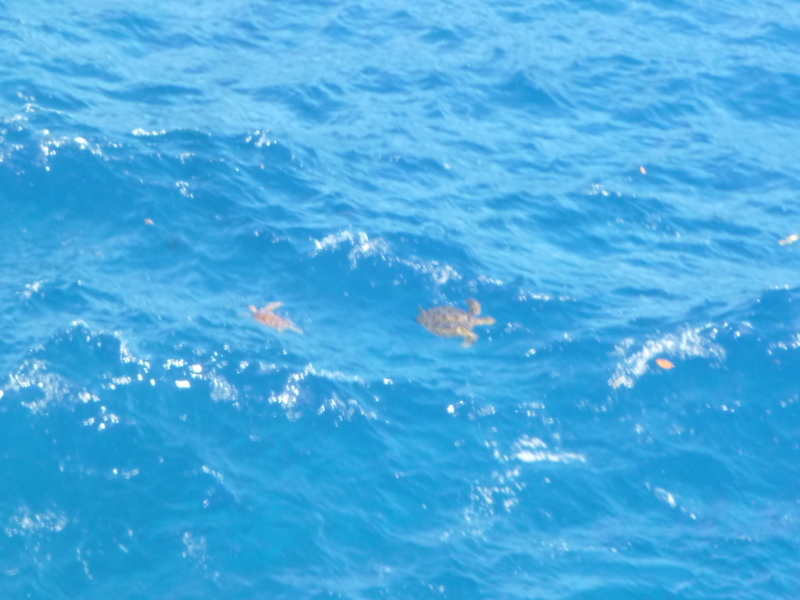 We were lucky to see about 8 sea turtles swimming in the water – usually they only see 2-3 at a time! That was pretty cool! I asked why there weren’t any neighborhoods or many businesses on that side of the island and she said it’s just too far away from where most people live. There was a big shopping center that had simply been abandoned years ago, and Mother Nature is in the process of reclaiming it. It looks strange to see such a big complex being overgrown like that – it’s a little eerie. It was a wonderfully interesting afternoon – both with what I saw of the island, and in listening to some of what Annie’s done in her life. Back as a teen, she won the Miss Northern Mariana Islands pageant, and toured lots of America with her first husband who was an Elvis impersonator, and she met lots of the famous older entertainers. 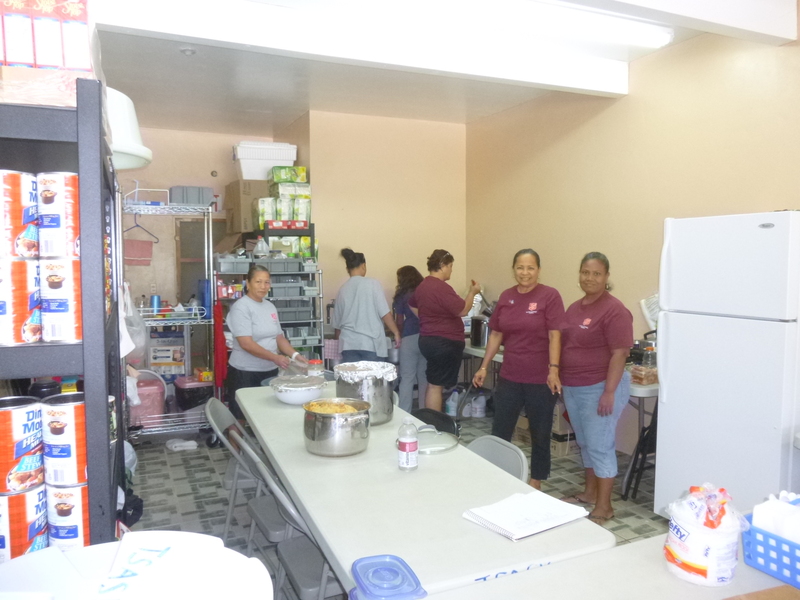 But in the end, she seems to find most fulfillment back on her island of Saipan, helping the needy. And she and her husband also sponsor family days for their volunteers and families. The grandkids were hungry, so we all had dinner together at my hotel – I tried to treat them as a thank you for the wonderful afternoon, but she wouldn’t have any of that! Once again, I never know what a day is going to hold!